these trades. As you learn about a few of the colonial trades from excerpts from this book, enjoy the students’ creativity and “way with words”. Jeffrey Baron showcased his knowledge of colonial apothecaries with this humorous poem on their skills and resources. Have a headache? Thyme will do the trick. Have skin lice? Some angelica would be nice. In my shop it may smell good but hopefully not bad. But when you feel better you’ll be glad. Grinding and mixing to make medicine. The mortar and pestle is quite a useful thing. I’m the apothecary to care for you quite quick. Just come into my shop when not feeling well or sick! Jake Adams wrote a detailed poem explaining the process a gaffer, or skilled glassblower, would use to create his works of art. As a light goes on inside the furnace. I will get his tools. To cool and smooth it out. And starts to make the molten glass the right size. So the gaffer uses his tools. A glass masterpiece is finished. Some of the best-known tradesmen are the blacksmiths, silversmiths, and tinsmiths for their pivotal role in providing tools to other tradesmen within their community. Michael Madore researched the whitesmith, who is also referred to as the tinsmith. In his poem about the whitesmith, Michael uses his senses to create a picture of this tradesman’s life. A whitesmith is also called a tinsmith. By heating and hammering the tin into place. He also made armor in place of the blacksmiths. that he has to shape. being burnt in the forge. when he rests his hand beside a betty lamp. while the other side is as dark as a lantern in a dark forest. while lamps and lanterns mask the dark side. That’s the life of a whitesmith. 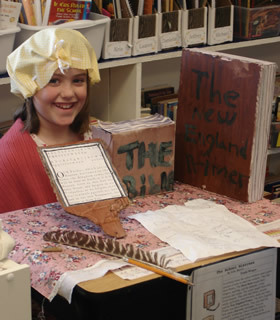 Throughout this extensive research project, the fourth grade students were able to experience life in colonial times and gain a good understanding of making a living as a tradesman. Gilford’s Thompson-Ames Historical Society was a valuable resource, providing us with authentic, antique tools used by some of our tradesmen. The fourth grade students were able to observe the pieces in a school display, while learning about them in the classroom. We thank the Thompson-Ames Historical Society for extending this great opportunity to our classes and school. Gilford’s Thompson Ames Historical Society welcomes comments on or suggestion for articles. You can email us at thomames@worldpath.net and visit our website at gilfordhistoricalsociety.org.